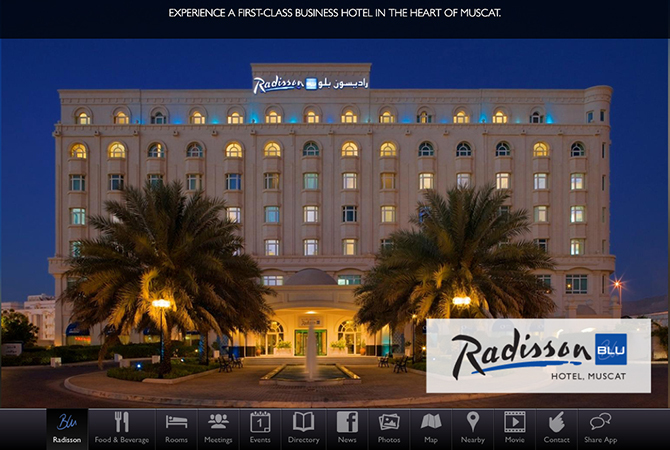 INTEWO | World Habitat Society GmbH has developed an innovative web app for the Radisson BLU Hotel in Muscat, Oman. The software app for smartphones and tablet computers provides guests and visitors with hotel and service information, such as room amenities, restaurants, menus, fitness- and business center, room service and much more. Current event information, as well as direct contact from the app to reception is also featured by this novel application. The application is serving mainly guests of the hotel. For example guests will be provided with the latest information and updates. As a special service, users will find, in a GPS supported map view, the main attractions in Muscat, as well as shopping centers, gas stations and other tourist-related information and infrastructure. In addition, the app helps guests also to find the way back to the hotel after a trip through the city. A movie about Oman, which is only accessible via the app and which can be purchased at the hotel’s gift shop as a DVD, is completing the multimedia experience of the application. The applications is running on all popular smartphones and mobile operating systems such as iPhone, iPad, Android, Windows Mobile and Blackberry. At various locations in the hotel, guests will find QR-Codes to directly access the app without going through one of the app stores. Using the free Wi-Fi at the hotel, guests will face no additional costs to use the service. Finally the app will also help to save costs. Expensive print products, such as brochures, posters and flyers with information on events etc. will be replaced by the app in the future.